When your Houston area business facility requires commercial construction, rely on the experts at ServiceMaster Advantage. We’re leaders in the construction industry, and we can help restore, remodel, and reconstruct your property if you ever find your office facing water, fire, or storm damages throughout Houston and the nearby areas. At ServiceMaster Advantage, our team of experts collectively has several decades of experience in disaster restoration, general contracting, building maintenance, carpentry, handyman services, and much more. With our commercial construction services in Houston, when you need your business facility to be restored, rebuilt, or remodeled, we are the team you can count on. With our commercial construction services in Houston, our team will coordinate, manage, and provide open communication throughout the entire construction process. 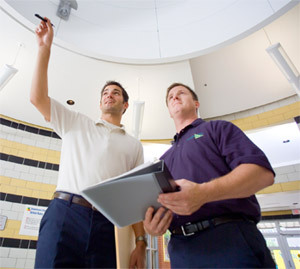 For high quality services, there’s no one better than ServiceMaster Advantage. When you need a facility to be restored, reconstructed, or remodeled, our team of experts will complete any task you have in mind. For additional details about our commercial construction services in Houston, please feel free to contact our office today to see how we can help you.